GST tag has been cleaved. Affinity purified GST-TRAF6 (mouse) and the depleted against GST. Raw cell lysates (1mg protein) were immunoprecipitated with increasing amounts of mouse anti-TRAF6 antibody or pre-immune serum for 2hr along with 10 μl of protein G. Immunoprecipitated proteins were denatured in SDS and subjected to 8% SDS-PAGE (Lanes 1-4). 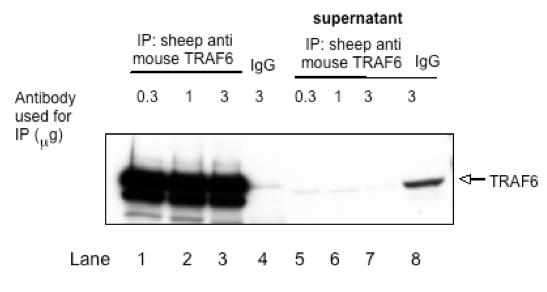 Lanes 5- 8 indicate the amount of mouse TRAF6 protein remaining in the supernatant after immunoprecipitation, the amounts loaded being equivalent to 25 μg of extract protein. Proteins were transferred to PVDF membrane and immunoblotting was carried out using rabbit polyclonal antibody against mouse TRAF6 (Assay Design) overnight at 1:5000.